Marco Eneidi died a few months before his 60th birthday, on May 24th, 2016, in Pleasanton, California. As Eneidi stated numerous times, his life as an artist in America was not an easy one. There is no mechanical relationship between the quality of music and acclaim, media coverage and the various indicators by which “success” can be quantified. Eneidi’s work was firmly inscribed, musically and humanly, in the long history of jazz, understood as a tradition of “innovation, extension, and expansion.” Once the music and the various factors conditioning its reception are uncoupled, what remains – and ultimately matters – is the music itself and the fact that it was made. Eneidi made it well, with rigor, and distinctively. What follows is an attempt, by no means exhaustive, to retrieve something of the forward motion which seemed to propel Eneidi’s creative work. New York’s Lower East Side in the 1970s underwent a massive disinvestment of real estate capital, producing a landscape of buildings left to rot and burn by owners for whom it had become economically rational. This was the world Marco Eneidi found when he moved to New York in 1981, at age twenty-four, from the West Coast. The Manhattan loft performance spaces which had hosted much of the avant-garde jazz playing of the ‘70s had by then nearly all closed down, and the music was entering a phase of retrenchment. But, on the streets of the “Loisaida,” east of Avenue A, one could still bump into many musicians who had made jazz history. Eneidi had come to New York to study with alto saxophonist Jimmy Lyons, one of the primary exponents of the instrument and Cecil Taylor’s closest associate. The lessons with Lyons put Eneidi on the path of building what he considered one of his main characteristics as an alto player: the ability to play at great speed while remaining harmonically and melodically coherent. He considered himself among a “second generation” of Bird disciples, a musician whose direct influences were rooted in Charlie Parker’s music. Eneidi first heard Lyons at San Francisco’s Keystone Korner. He was a regular patron at a time when the club booked the likes of Sam Rivers, Henry Threadgill and Anthony Braxton. Also in California, Eneidi met another of the alto saxophone greats, Sonny Simmons, who would become his first teacher and whom he credited for giving him “sound, tone, and color.” His intense sound was another of Eneidi’s defining characteristics. Simmons passed on musical information and stories, transmitting the music in all its historical weight and initiating Eneidi to the “oral tradition” in jazz. Marc “Marco” Bennett Eneidi was born on November 1st, 1956 in Portland, Ore. His father, Walter Eneidi, worked at the Lawrence Radiation Laboratory – the “Rad Lab,” which notably developed nuclear missiles warheads – in Livermore, Calif., where Eneidi spent his early childhood and started to play the clarinet. His mother, Margaret Bennett Eneidi, worked as a paralegal and with developmentally disabled children. The family moved to Oakland, where Eneidi attended high school. The strong impression made by the discovery of the 1960 recording ColtranePlays the Blues led Eneidi to the alto saxophone. Early musical interests included rhythm and blues, the delta blues players, and the San Francisco rock scene, notably Janis Joplin and Jefferson Airplane. Eneidi enrolled at Mt. Hood Community College in Portland and Sonoma State University in Rohnert Park, Calif., where he studied African, North Indian and Balinese music and became interested in ethnomusicology. His first professional gigs were played on the local scene – which he would retrospectively describe as quite “square.” He played swing in a band led by saxophonist Glenn Blair, a veteran of the hotel show bands circuit, which performed in nursing homes, psychiatric hospitals and public schools, in the context of the Nixon’s administration CETA programs. In 1980s New York, after a chance encounter with “modern, really hip sounds” emanating from a building while walking by Tompkins Square Park, Eneidi met the members of the band responsible for the music. It was Jemeel Moondoc’s ensemble, with bassist William Parker, trumpeter Roy Campbell, Jr. and drummer Denis Charles, a veteran of the early days of the avant-garde. Eneidi started to take part in the open rehearsals held by Moondoc and to attend bop jam sessions at the University of the Streets, on the other side of Tompkins Square Park. This led him to sessions in Harlem and the Bronx, where traditional styles were played in a hard swinging, “real mean and driving [...] East Coast” style and involved people like Stanley Turrentine and Big Nick Nicholas. As did many musicians, Eneidi played on the streets to make money. Eneidi’s first apartment was in an area where the drug economy flourished and patches were open-air heroin markets. In an interview for Theoral, Eneidi described practicing his saxophone against a backdrop of dealers shouting the names of their products in the nearby street. His private playing always consisted of a lot of saxophone and drums duets, a practice initiated in those days with close friend Jackson Krall. Soon, William Parker invited Eneidi to join his large ensemble. He struck up a friendship with saxophonist Jim Pepper and, making further connections, came in touch with veterans like Dewey Redman, Rashied Ali, Ed Blackwell, C. Sharpe and Don Cherry, whom he considered mentors. A number of the younger musicians with whom Eneidi mixed had been at the University of Wisconsin-Madison and Antioch College when Cecil Taylor taught there at the turn of the ‘70s, and his influence was pervasive. Non-musical work was a constant in Eneidi’s life. He drove a cab during the first half of the ‘80s, and, among a variety of other jobs, later worked in asbestos abatement and construction. As the ‘80s unfolded, the Manhattan housing market reclaimed the Lower East Side, driving rents up and heavily increasing the economic pressure on its residents. The harshness of the New York musicians’ lifestyle, poverty and periods of homelessness led Eneidi to regularly “escape,” taking time to recover and make money on the West Coast. Those breaks from New York included time spent taking lessons with saxophonist Bert Wilson in Olympia, Wash., and studying North Indian classical music at the Ali Akbar College of Music in San Rafael, Calif. Most of the music making in which Eneidi took part in the ‘80s was not documented on records. His work in the Earl Cross Nonet, Saheb Sarbib’s Multinational Big Band, William Parker’s ensembles and Sunny Murray remains unheard. A little-known tape of Jackson Krall’s Secret Music Society at the Shuttle Theatre constitutes a welcome exception. Eneidi’s first presence on a commercial recording came about through his work with Bill Dixon at Bennington College. Hired by the trumpeter as artist-in-residence in the Vermont school’s Black Music Division in 1984, Eneidi was exposed to Dixon’s thought, which would leave a lasting impression and prove invaluable for questions pertaining to the organization of the music. It was also in Vermont that the first LP documenting his own music was made, with William Parker and Denis Charles. After having unsuccessfully tried to sell the tape to European labels, Eneidi independently released the music, using the money inherited from a great aunt in Italy. It was the tentative start of Botticelli Records, named for his recently born son, Niccolo Botticelli Eneidi.. Attempts to organize the Lower East Side avant-garde jazz musicians were made in the early ‘90s. Part imprint and part distribution service, Stork Music regrouped cassette tapes independently produced by musicians. It was in this context that Eneidi reactivated Botticelli. The first releases included Final Disconnect Notice, a session with Karen Borca, William Parker, Wilber Morris and Jackson Krall which – two decades later – could legitimately be considered a classic, documenting a coming-of-age Eneidi. Dancer Patricia Nicholson-Parker created the Improvisors Collective, which put on weekly shows regularly including Eneidi, who also had organizational duties. The Collective was short-lived, but gave way to the first Vision Festival. In 1992, work with trumpeter Raphé Malik took Eneidi to his first European gigs, as well as to the Boston area, where he also played with Dennis Warren. Drummer Nick Skrowaczewski recalls practice sessions with Eneidi while studying at Bennington, where the saxophonist retained connections. “He had a lot of knowledge and experiences to impart already by that point,” and was now in a position to perpetuate the direct transmission process he had been a beneficiary of. Seizing an opportunity offered by the unavailability of the alto saxophonist employed by Cecil Taylor after Jimmy Lyons’s death, Eneidi called the pianist and joined the band. For many musicians of his generation, playing with Taylor represented a crowning achievement. Eneidi considered this work as the culmination of ten years of prior musical experiences and would recall the music played as the most demanding he had ever been involved with. It was the start of an on and off association with Taylor, who first brought Eneidi to Europe in 1992. Taylor had a strong impact on Eneidi’s compositional style. He adopted the pianist’s alphabet notation system and the concept of “unit structures.” Along with Bill Dixon, Taylor – whose poetry Eneidi could spontaneously quote – was the musician he would most regularly refer to as a major influence. Through Raphé Malik, Eneidi formed a close friendship with tenor saxophonist Glenn Spearman. An article in Cadencediscussing their first recording together, The Marco Eneidi Coalition, on its release inscribed it in a larger movement of reemergence of free jazz anchored in the ‘60s taking place at the time. While this context was certainly of importance, it also did not account for the variety of coexisting musical lineages. 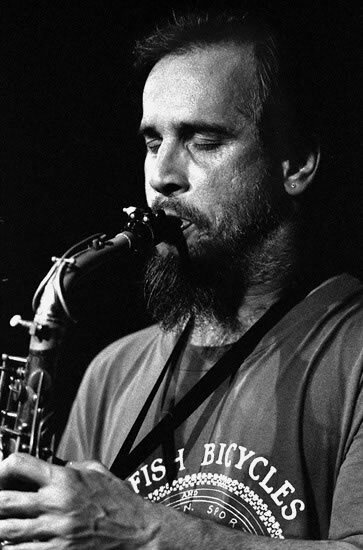 Spearman had been mentored by Frank Wright in France, taking as a point of departure developments brought about by Albert Ayler and John Coltrane near the end of his life, while Eneidi’s approach found its sources in the early days of the avant-garde, musical thought which had emerged from the inside of the be-bop form. Without work and living in abandoned buildings, Eneidi initiated a return to the West Coast in the mid-‘90s. Working with Glenn Spearman, he benefited from the dynamism of the San Francisco scene. Their collaboration yielded a number of striking recordings, such as Live at Radio Valencia. Spearman and Eneidi managed the rare feat of putting together a regularly appearing large ensemble, the Creative Music Orchestra, one of the few in activity along with William Parker’s Little Huey, in which Eneidi also played. Putting to use techniques learned from Bill Dixon and Cecil Taylor, Eneidi later continued his orchestral work with the American Jungle Orchestra, named in tribute to Sonny Simmons. After Spearman’s death from cancer, Eneidi organized three editions of a festival named after him, gathering musicians such as Eddie Gale, Oluyemi Thomas and Peter Brötzmann. A recording pairing the German saxophonist and Eneidi was made on the heels of the last edition in 2002, considered by bassist Lisle Ellis as a high point of his extended collaboration with Eneidi. At Mills College, Eneidi obtained an MA in music composition, hoping to secure a position teaching in higher education. He wrote a thesis entitled “Aeneidio Phonics,” which constitutes the most extended documentation of his musical thought. In his dissertation on the Californian improvised music scene, Jason Robinson describes the substantial influence of approaches developed in Europe and of composers like John Cage. Comments made by Eneidi on this later aspect showed a degree of incompatibility between his music, which he reaffirmed as coming “right out of be-bop,” and part of the local scene, which he saw as more oriented toward “concepts” than toward jazz. In addition to his local anchorage, Eneidi took up opportunities to play wherever they arose, touring with Lisle Ellis and Peter Valsamis, Jessica Loos and Spirit, playing with Peter Kowald or with Sabu Toyozumi in Japan. He recorded for Music & Arts, Eremite, and CIMP. Reporting on the shutting down by the police of a venue Eneidi was scheduled to play, the TransbayCreativeMusic Calendar, painted a bleak picture of the state of affairs in San Francisco at the turn of century. In 2004, Eneidi quit the substitute teacher job he had held in Oakland and flew to Austria. Mark Leonard and Stanley J. Zappa’s Get Out film captures Eneidi’s music making with regular collaborators, including Donald Robinson and Damon Smith, right before his departure for Europe. Although not apparent, Eneidi was at this point in critical medical condition. Musicians passing through Vienna regularly attended Eneidi’s sessions. Drummer Lou Grassi recalls the impression made by the scene created by Eneidi: “he had jazz musicians, classical musicians from the symphony and opera, heavy metal and acid rock musicians, all coming out to try their hand at free improvisation under Marco’s guidance and encouragement. I’d never experienced anything like it.” Austrian immigration policies made non-musical work impossible and Eneidi “[had] to make the music work.” He played concert dates, notably in Eastern European countries, and for art openings. Visits to the United States found him pursuing his work with long-time collaborators. An invitation to play a festival in Mexico had led to the creation of the Cosmic Brujo Mutafuka, with drummer Gabriel Lauber and bassist Itzam Cano. In 2015, Eneidi moved to Mexico, where his final recording was made, Rhapsodyof the Oppressed. Despite renewed interest and coverage on aspects of the complex history of the avant-garde in jazz, the “secret music” evoked in Jackson Krall’s band name remains well guarded. Marco Eneidi was a strong representative of an underground within an underground. He left behind a profound body of work, there to be considered and heard on its own terms, free from all hype or sales pitches. Should this biographical sketch also be read in negative? Should some thoughts be directed toward what it does not but could have contained, had things been different? As Stanley J. Zappa puts it, Marco Eneidi “did make the rounds, and in so doing played some pretty great gigs with some really fantastic musicians.” Surely, when reflecting on the life of a musician, this is what matters most. I was expecting him to arrive in about a week when I heard the news that he had passed away. We had been in touch and then I didn’t hear from him. I was worried. He had plans to move to New Haven, where I live. He had arranged a place to stay and was planning to get some substitute teaching work lined up, and make a go of being here permanently. But he never made it. I can’t say I knew him well for long. I can say I respected his music for a long time. Once I did get to know him, I thought of him as a close friend, a soul brother. His death was and still is a shock to me and a serious loss to music. He was one of the great alto players. I miss him. * Thanks to Lisle Ellis, Lou Grassi, Olivier Ledure, Joe Morris, the F. W. Olin Library at Mills College, Jason Robinson and Nick Skrowaczewski for their contributions. Special thanks to Marc Chaloin, Thierry Trombert and Stanley J. Zappa. Chacona, John. “Marco Eneidi: In Search of a Scene.” Signal to Noise, Fall 2001, 11. Początek, Anna. “Marco Eneidi: Palettes of Color & Sound.” All About Jazz, May 27, 2013. https://www.allaboutjazz.com/marco-eneidi-pallettes-of-color-and-sound-marco-eneidi-by-anna-poczatek.php. Schmickl, Philipp. “Marco Eneidi.” Theoral, no. 1 (Mar. 2011): 13-49. Online version available on Theoral website, https://theoral.files.wordpress.com/2016/07/hpmarcoeneidi1.pdf. Singh, Taran. “Marco Eneidi Interview, Oct. 8, 2005.” Taran’s Free Jazz Hour, Apr. 2, 2006. http://taransfreejazzhour.com/podcast/marco-eneidi-interview-oct-8-2005.html. Transcript available at All About Jazz, https://www.allaboutjazz.com/marco-eneidi-still-here-marco-eneidi-by-taran-singh.php. Van Trikt, Ludwig. “Marco Eneidi: Interview.” Cadence, June 2003, 5-11. York, William. “RIP Marco Eneidi (1956-2016).” That Was Then / This Is Yesterday, May 26, 2016. https://thatwasthenthisisyesterday.wordpress.com/2015/02/25/interview-marco-eneidi-2002/. Transcript of an interview conducted for a San Francisco Bay Guardian article in 2002, https://web.archive.org/web/20020623145858/http://www.sfbg.com/36/25/art_music_odds.html. Chaloin, Marc. Interview with Marco Eneidi. June 2, 1997, New York City, N.Y.
Robinson, Jason. Interview with Marco Eneidi. Apr. 26, 2003, Oakland, Calif.
Lopez, Rick. “The Glenn Spearman Sessionography.” The Whole Shebang, July 8, 2015. http://www.bb10k.com/SPEARMAN.disc.html. Lopez, Rick. “The Marco Eneidi Discography.” The Whole Shebang, May 26, 2016. http://www.bb10k.com/ENEIDI.disc.html. Lopez, Rick. The William Parker Sessionography. N.p. : Centering, 2014. Online version at The Whole Shebang, http://www.bb10k.com/PARKER.disc.html. Young, Ben. Dixonia: A Bio-Discography of Bill Dixon. Westport, Conn.: Greenwood Press, 1998. Currie, A. Scott. “Sound Visions: An Ethnographic Study of Avant-Garde Jazz in New York City.” PhD diss., New York University, 2009. Mele, Christopher. Selling the Lower East Side: Culture, Real Estate, and Resistance in New York City. Minneapolis: University of Minnesota Press, 2000. Robinson, Jason. “Improvising California: Community and Creative Music in Los Angeles and San Francisco.” PhD diss., University of California, San Diego, 2005. Zlabinger, Thomas Albert. “Free from Jazz: The Jazz and Improvised Music Scene in Vienna after Ossiach (1971-2011).” PhD diss., City University of New York, 2013. Chaloin, Marc. “Jackson Krall: Interview.” Improjazz, Jan. 2000, 12-21. Chaloin, Marc. “Patricia Nicholson-Parker.” Improjazz, May 2003, 11-17. Parker, William. “Jackson Krall: I Always Thought of Myself as a Jazz Drummer.” In Conversations II: Dialogues and Monologues, edited by Ed Hazell, 353-372. Paris: RogueArt, 2015. Rusch, Bob. “Glenn Spearman: Interview.” Cadence, May 1994, 5-14. Chaloin, Marc. “‘Free Jazz’ à New York: Une tentative d’état des lieux.” Improjazz, July 1997, 25-28. Chaloin, Marc. “Réflexion d’une Vision.” Improjazz, Aug.-Sept. 1998, 30-33. Chaloin, Marc. “Vision Festival, an 2.” Improjazz, Aug.-Sept. 1997, 15-22. Eneidi, Marco. “Aeneidio Phonics.” Master’s thesis, Mills College, 2000. Eneidi, Marco. “Autoportrait.” Le son du grisli, May 26, 2016. http://grisli.canalblog.com/archives/2016/05/26/33867791.html. Fine, Milo. “Tape Talk.” Cadence, Sept. 1993, 33-34. Improvisors Collective papers, 1994-1995. Rozanne Levine archives. Ledure, Olivier. “Marco Eneidi, travailleur de l’ombre.” Improjazz, Nov.-Dec. 2016, 4-21. “Marco Eneidi Obituary.” San Francisco Chronicle, June 12, 2016. http://www.legacy.com/obituaries/sfgate/obituary.aspx?pid=180295858. Stork Music catalogs, 1992-1994. Thierry Trombert archives. Tapon, Philippe. “In San Francisco, Experimental Music Space Deemed Criminal.” Transbay Creative Music Calendar, Feb. 2001, 1. http://transbaycalendar.org/archive/TB_2001_02.pdf. Jahn, Ebba, dir. Rising Tones Cross. FilmPals, 1985. DVD. Leonard, Mark, and Stanley J. Zappa, dirs. Get Out. Cocklesdorf Pictures, 2005. https://www.youtube.com/watch?v=6POaeePcCYY. Thanks to Lisle Ellis, Nicco Eneidi, Lou Grassi, Olivier Ledure, Joe Morris, the F. W. Olin Library at Mills College, Jason Robinson and Nick Skrowaczewski for their contributions. Special thanks to Marc Chaloin, Thierry Trombert and Stanley J. Zappa.